John Harris – USFS Middle Kyle Canyon Project Manager – John will be unveiling details regarding the Middle Kyle Canyon park, visitors center, and gift shop that will soon be constructed. Steve Ririe – Chairman of the Silent Heroes of the Cold War National Memorial Committee. Steve will tell the story of the 1955 top-secret plane crash on Mt. Charleston. TD Barnes – Retired Special Projects Manager Area 51. TD will talk about his experience at Area 51 and the heroes that were lost. Ken Walther – Retired CIA Operative. Ken will speak about the need for a memorial to honor all heroes that worked in secret during the cold war. George Tate – SHCW Memorial Architect and Lane Swainston – SHCW Project Manager. George and Lane will unveil the memorial design, explain the significance designed into the memorial, and answer questions regarding it construction. Frank Murphy, former CIA A-12 pilot stationed at Area 51. Frank spotted the USS Pueblo that was captured by North Korea in 1968. Bob Murphy, former Lockheed engineer stationed at Area 51. Bob was scheduled to fly to Area 51 on November 17, 1955 but he missed his flight. 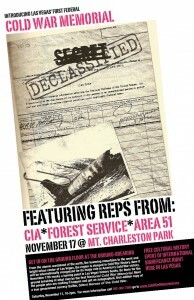 Also, two Area 51 base commanders will also be in attendance. As part of this event, the Nevada Aerospace Hall of Fame will be having a Banquet that evening at 6 p.m. at the Henderson Executive Air Terminal. CIA Pilot Frank Murphy will be inducted into the Nevada Aerospace Hall of Fame. This event is open to the public and reservations can be made by going to their website nvahof.org. Directions to the Middle Kyle Canyon Project Site: Take Federal Hwy 95 heading north toward Reno. As you leave Las Vegas go 2.5 miles to State Hwy 157 and take a left turn. The sign on Hwy 95 indicates that Hwy 157 is the Mt. Charleston exit. Go another 15 to 20 miles till you arrive at the Middle Kyle Canyon Project Site (just before the Mt. Charleston Hotel).